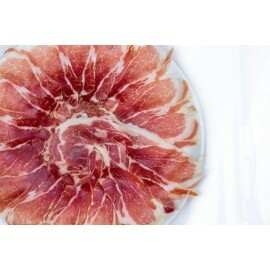 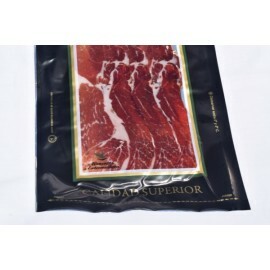 Plate of Iberian pork ham of "cebo", 100% Iberian, cut by knife by professional cutters Ismael Pozas Gómez, Antonio Pozas Gómez or Roberto Pozas Gómez. 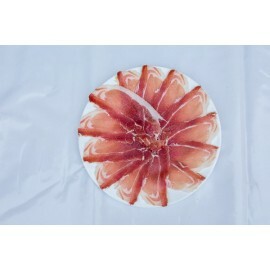 It is presented in a box of ten plates cut decorated with white lace paper for easy presentation. 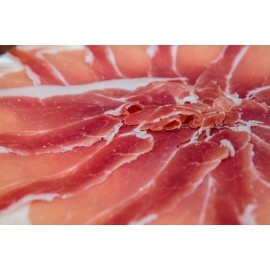 Each plate is vacuum packed and the net weight of the ham is 100gr.